Lillian believes that bicycles are a key solution to making our planet a healthier, happier place. From hosting a national conference on biking to school to leading bicycle camping trips with Cycle Wild, Lillian is involved with nearly everything with chainrings in Portland. 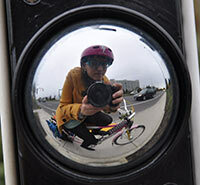 At the Bicycle Transportation Alliance, she started Walk + Bike to School Challenge Month. Four years later, it's a national model program involving 15,000 elementary students. She's also the producer for the Portland Afoot transit podcast and has won the McGill Lawrence Fellowship, the Ducey Policy Fellowship, and the Simpson Grant. In her free time, she dresses as a superhero and grills pancakes for commuters on the back of her cargo bicycle.